I have personally been a long-time fan of Samsung’s smartphones as the brand has never shied away from taking big leaps. Let me jog your memory – the company was the first to bring a capacitive fingerprint scanner with its Galaxy S5, dazzled the world with the secondary display on the Galaxy Note Edge (review) and stunned photographers with the dual aperture cameras on the Galaxy S9 (review) series. The new Samsung Galaxy A80 continues that legacy. The smartphone marks a couple of firsts for the company and mobile devices in general. 91mobiles was at the launch event in Thailand and here’s what we think of the smartphone after spending some time with it. When the Samsung Galaxy S10 phones with punch-hole displays were announced, I remember thinking that the next one from the company is likely to ditch the piercing as well. What I was curious about is how the company will implement it and looking at the Galaxy A80, I am pleasantly surprised. The smartphone is the first from the chaebol to come with an all-screen display. So where is the front camera you ask? Samsung has joined the sliding mechanism bandwagon but with a twist. The top rear portion of the smartphone is a motorised sliding component with a triple camera module. The module rotates on the horizontal axis to become the selfie shooter when the mechanism is elevated. While the idea is not new (remember the OPPO N3? ), it’s the first of its kind to feature in an elevating mechanism. But before we delve into the details of the unique design of the Galaxy A80, let’s get the mundane details out of the way. The Samsung Galaxy A80 comes flaunting a glass-sandwich design with a curved back panel, which makes for good ergonomics. The power button is located on the right spine and volume buttons can be found on the left edge. The bottom edge is home to the SIM tray, USB Type-C port and the loudspeaker grille. 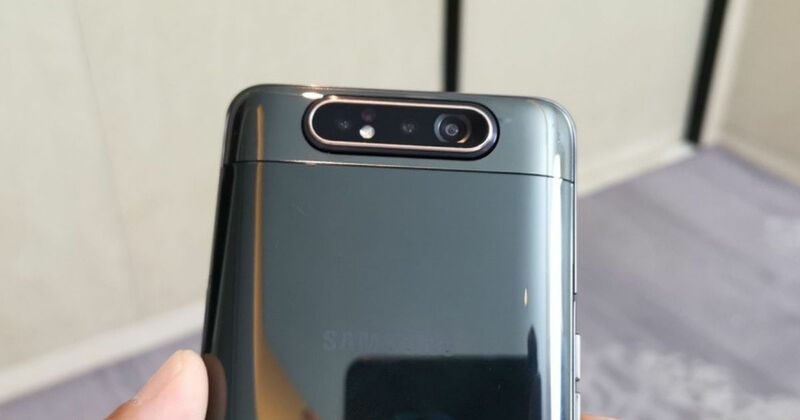 Samsung has also changed the position of antenna bands on the Galaxy A80. They are now placed on the sides, above and below the physical buttons, and the jury is still out on whether or not the new positioning improves the reception. Moving on to the display, the Galaxy A80 is the first from the brand to come with an all-screen fascia. There are minimal bezels on three sides with a tiny slit for earpiece on the top and a very slim chin. The Super AMOLED display measures 6.7-inches diagonally and offers a screen resolution of 2,400 x 1,080 pixels. As expected, the screen is pretty vivid and bright. Inside the smartphone ticks the latest chipset from Qualcomm, the Snapdragon 730G. The processor uses 8nm fabrication process, and is touted to come with industry-leading on-device AI. Accompanying the chipset is 8 gigs of RAM and 128GB expandable storage. The smartphone boots Android 9 Pie based One UI, and offers an in-display fingerprint scanner for security. Powering the handset is a hefty 3,700mAh battery. Let’s talk about the camera module on the Galaxy A80, which is one of its kind at the moment. The smartphone features a triple camera setup comprising a 48-megapixel f/2.0 primary shooter, an 8-megapixel f/2.2 ultra-wide angle lens with a 123-degree field of view, and a 3D ToF sensor. The setup is accompanied by a dual tone LED flash. The cameras look very promising, and it’s worth noting that the same set of cameras handle selfie duties as well. When you switch to the selfie camera on the smartphone, the top rear portion of the smartphone slides out and at the same time, the camera module swivels on its axis to face forward. This makes the Galaxy A80 the only smartphone with a triple lens selfie camera setup. Our initial shots with the phone were pretty good, but we will reserve our judgement for the detailed review. The Samsung Galaxy A80 gets full marks for innovation in my books and doesn’t skimp on the spec sheet either. This makes the latest offering from the South Korean giant a very compelling offering. However, the smartphone is yet to arrive in India and if Samsung prices it right, the Galaxy A80 can blow rivals out of the water.